In this guest post, Ginger Lukas and Matt Merkel Hess share their plans for Watershed 2019 Residency Session V: The New Ancient. Several spots are still available for those interested in joining the group from August 11-23. Learn more and register for this session. Our Watershed session, The New Ancient, will focus on how to use the 15,000-year history of vessels to make ceramics in our post, post, postmodern time. Through shared work time with a variety of invited artists and a visiting critic, we’ll examine how history, technology, tactility and humor inform pottery today. 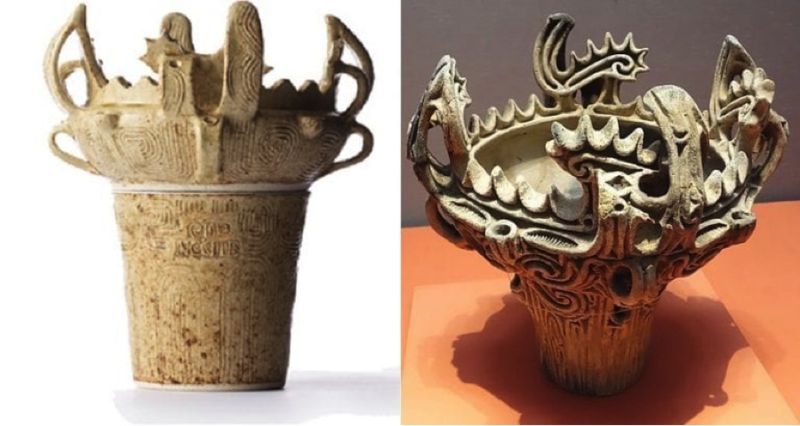 The idea for the session started with a news article in Fall 2017: Japanese instant noodle maker Nissin released a limited edition Jomon Doki Doki ceramic Cup Noodle cooker that was a small but faithful recreation of a 3,000 year old Jomon vessel. Combining ceramics, pop culture and utility in a meme-worthy idea sparked a conversation between the two of us that has continued to this day. We first connected online almost a decade ago and our studio visits and texts are almost always a dialogue around ceramics, critical issues in craft, and clickbait-ish pottery memes and other articles. As trained vessel makers, we are constantly asking what the pottery of the information age can/should look like. We now have access to nearly every documented pot in history, but what do we do with this knowledge? As these issues are foremost on our minds, we will bring them into the shared studio environment of Watershed. We are very pleased to be joined by artists Ebi Baralaye, Stephanie Kantor, Jeffry Mitchell and Robert Raphael who all work with expansive ideas of the possibilities inherent in the vessel. Through a shared dialogue with these amazing artists, and visit for a few days by curator and critic Elizabeth Essner, we hope to circle around issues of the vessel for today and in the future. The New Ancient is all about the mishmash of information, styles, and techniques in this age of Google Image search – we know everything about the past but are still discovering what can be mined in the present. Please join us this August as we continue this process of figuring out what vessels tell us about ourselves and the future. Any artist who is comfortable working independently in a clay studio may join this residency session. Sign up for the session here. For those interested in participating with the support of scholarships or work-exchanges, please apply here. Financial assistance applications are due February 15.